Long recognized as an outstanding chamber musician, Anthony Marwood has more recently been making waves as a concerto soloist, with two contributions to the Romantic Violin Concerto series and now a disc of Britten with the BBC Scottish Symphony Orchestra and Ilan Volkov. The youthful Violin Concerto, with its mix of anguished lyricism and changeability of mood nods to both Berg (whose own Violin Concerto had made a profound impression on Britten) and Prokofiev but the result is entirely personal. 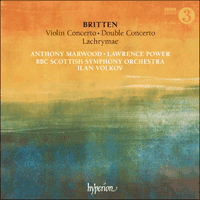 The still earlier Double Concerto, for violin and viola, is impressive above all for its precocious confidence; written when Britten was just eighteen and still a student at the Royal College of Music, it had to wait sixty-five years before receiving its belated premiere in 1997 at the 50th Aldeburgh Festival. Anthony Marwood is joined by star violist Lawrence Power (who makes two appearances in Hyperion’s new releases this month). The viola was Britten’s own instrument and his Lachrymae, inspired by a Dowland song, brings us to the other end of his career, for though it was composed in 1950, it wasn’t orchestrated until 1976, the year of his death. When Benjamin Britten took up his scholarship at the Royal College of Music on 22 September 1930, not yet seventeen years of age, he had already amassed considerable experience as a youthful composer of prodigious facility. Although he officially studied composition with John Ireland at the Royal College, he found the atmosphere of the institution uncongenial and owed far more to the inspirational tutelage of Frank Bridge, with whom he had been studying privately for some three years prior to his move down to London from his native East Anglia. It was after working with Bridge, for example, that Britten composed one of the finest of his juvenile pieces, the orchestral Quatre Chansons françaises (1928), written for his parents’ twenty-seventh wedding anniversary and—like many of Britten’s pre-College compositions—not performed until after the composer’s death in 1976. The vast quantity of Britten’s teenage work, inevitably of rather uneven quality, meant he can have had few qualms about abandoning it once his mature compositional voice began to assert itself, which he felt to be the case with his Sinfonietta (1933; the only work of his to be performed at the RCM during his time as a student there), the choral variations A Boy was Born (1934), and the politically charged song cycle Our Hunting Fathers (1936). 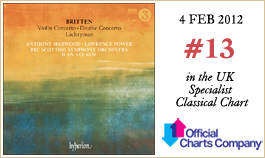 One of the most substantial of Britten’s teenage works to have been rescued from oblivion is the Double Concerto in B minor for violin, viola and strings, which he composed between 9 March and 1 July 1932 in his penultimate year as a student at the RCM. The first movement was written in just two days, Britten’s diary entry for 10 March proudly noting: ‘I finish the first movement of my 2ble concerto in evening having written a lot.’ The following day he showed the music to Ireland, commenting in his diary that his teacher was ‘pretty pleased with my concerto so far’. On 17 March Britten reconsidered various aspects of the score: ‘I do some altering & a good deal of addition to my 1st mov. of concerto in morning.’ He was working on the slow movement between 18 and 21 March, and finished the finale on 4 May (the day he was informed he had won the unlikely sum of £13.13s from the award of the RCM’s Cobbett Prize). He then put the concerto to one side in order to devote his full attention to the composition of the Sinfonietta; the last diary entry relating to the unfinished piece comes on 1 July, when he revisited and completed the slow movement. The Double Concerto received its long-delayed first performance on 15 June 1997 as part of the fiftieth Aldeburgh Festival, with Katherine Hunka and Philip Dukes as soloists and the Britten–Pears Orchestra under Kent Nagano (who the following year conducted the premiere recording, for Erato, with the Hallé and soloists Gidon Kremer and Yuri Bashmet). Colin Matthews, who prepared the work’s full score from Britten’s short-score draft and commented that he found the manuscript to be ‘complete in practically every detail’, felt that the most likely explanation for the composer’s sudden abandonment of the project was his growing disaffection with the performance environment at the RCM. Certainly the experience of trying to rehearse his Sinfonietta was discouraging. Britten declared to his diary on 22 September: ‘I have never heard such an appalling row!’ Exactly one week later he wrote: ‘I got to RCM at 11.0 for the most execrable rehearsal of my Sinfonietta’ (several instrumentalists had failed to show up); on 13 October he suffered ‘the most atrocious of all rehearsals of my Sinfonietta … What an institution’. The next day he reported that ‘new arrangements are made that my Sinf. should sound less like anemic cats’. But there is also evidence that Britten was unhappy with the musical quality of the Double Concerto. His first attempt at the slow movement (18 March) is described as ‘an unsatisfactory beginning’, and three days later he lamented: ‘Spent practically whole day writing a fatuous slow movement for my concerto—only 2/3rds of it.’ By the end of the month his frustration had grown acute: ‘Write more of last mov. of Concerto in morning—I shall tear that up soon’ (29 March); and on the day he finished drafting the finale (4 May) he concluded ‘I expect I shall scrap it all’ before signing off two days later with ‘I’m putting my Concerto away for a bit’. On 19 April 1936 Britten attended the posthumous first performance of Berg’s Violin Concerto at the International Society for Contemporary Music in Barcelona, an occasion which he found ‘shattering’. Britten was there to perform his fiendishly difficult Suite for violin and piano (Op 6) with a friend of Frank Bridge, the violinist Antonio Brosa, with whom he had already broadcast the work in the UK. Britten and Brosa kept in touch after the composer’s emigration to the USA in May 1939, by which time he had already begun to write a substantial Violin Concerto for the soloist (the composer referred to it at the time as ‘a big heavy-weight’). The concerto was completed in Quebec later that summer, and Britten prepared the piano reduction in New York (where he was to settle), continuing to work on the orchestration in September. Britten hoped a US premiere for the concerto would not only help his own reputation but also enable Brosa to gain further work in America. The composer wrote to his publisher, Ralph Hawkes, on 21 November about the work’s impending publication: ‘It seems a little risky without me having heard Toni play it to engrave it, but I have written to him, asking him to be honest and tell me what passages are ineffective and what alterations he suggests. Also I am hoping that he will finger and bow the part for the edition (“edited by Antonio Brosa”).’ Brosa travelled to New York to give the first performance, at Carnegie Hall on 28 March 1940 with the New York Philharmonic under John Barbirolli, having been detained on arrival at Ellis Island by immigration officials on suspicion of his being ‘a doubtful visitor’—presumably on account of his Spanish citizenship. The Violin Concerto’s premiere was generally well received by both public and critics. Undoubtedly the piece represented a new depth of maturity in Britten’s music, most obviously in the extended Passacaglia finale (a form later to become one of the composer’s most characteristic and resourceful structures). In the New York Times, Olin Downes wrote: ‘Mr Britten has given us something that has a flavor of genuine novelty in the violin concerto form … The moods of the music traverse those of the poetical, the satirical and elegiac … The instrumentation, sometimes very simple, often very brilliant, is so expert that the violin is never covered when it is intended to show forth.’ As earlier in Britten’s career, however, some critics evidently enjoyed carping about his achievement, and this tendency was particularly noticeable when the work subsequently received its first UK performance, at London’s Queen’s Hall on 6 April 1941 (when the soloist Thomas Matthews was accompanied by the London Philharmonic under Basil Cameron). The Times, for example, declared on 7 April: ‘If the audience found some of the way heavy going they put a brave face on it and applauded with heartiness when it was over. Our own feeling was one of disappointment that so little is achieved from so large a display of ingenious effort.’ The Liverpool Daily Post wondered if the concerto was ‘really too clever’, but noted the ‘moments of genuine tone-poetry’. Britten later revised the work on several occasions—in 1950, 1958 and 1965—partly (and somewhat ironically) to remove what he felt had been Brosa’s excessive editing of the solo part, but also to amend the proportions of the finale. The score was dedicated to Britten’s friend Henry Boys, who had been his fellow student at the RCM; a capable pianist, Boys had (at the composer’s own suggestion) accompanied Brosa when he was rehearsing the work in the UK and demonstrating it to Barbirolli prior to travelling to America for the premiere. Lachrymae, Britten’s ‘Reflections on a song of Dowland’, was composed in April 1950 for the Scottish viola player William Primrose and first performed—in its original version for viola and piano—by dedicatee and composer at that year’s Aldeburgh Festival. The piano part was later arranged for small string orchestra (unusually lacking first-violin parts) in 1976 at the suggestion of Cecil Aronowitz, who performed it at the Aldeburgh Festival the following year, six months after Britten’s death. The work is a satisfying synthesis of various musical elements carrying a strong personal significance for the composer. The viola had been his own instrument since childhood and, although his recorded legacy as a violist consists of the modest contribution of a single (but crucial) note in Purcell’s Fantasia Upon One Note with the Zorian Quartet in 1946, he fully exploited the instrument’s capability for producing intensely mellow sonorities in both orchestral and chamber works. In casting the Lachrymae in the form of a seamlessly evolving set of variations Britten was able to draw on the vast experience he had gained with this musical structure in the 1930s and 1940s. And his decision to select John Dowland’s famous song ‘If my complaints could passions move’ (First Booke of Songes or Ayres, 1597) as the basis for the piece continued the celebration of English musical and literary heritage which had constituted a fundamental part of his art since his return home from America in the early 1940s. In the middle of the piece Britten alludes to another famous Dowland song, ‘Flow my tears’ (Second Booke, 1600). Dowland’s theme has a strong rising and falling shape which makes Britten’s transformations of it readily comprehensible to the listener. Tremolo allusions to its melodic profile at the opening usher in a quiet statement of the theme in the lower strings, but the harmony remains complex and elusive until the very end of the work when, in a moment both technically adept and artistically magical, Britten’s music gradually merges into the simple but expressive harmonic idiom of Dowland’s original song. This idea of a theme and variations ‘in reverse’, as it were, was later adopted by Britten in his second set of Dowland ‘reflections’ for solo guitar, Nocturnal (composed for Julian Bream in 1963, and recorded on CDA67648), and in the treatment of Russian themes in the Cello Suite No 3 (composed for Mstislav Rostropovich in 1971). Le 22 septembre 1930, lorsqu’il fut reçu boursier au Royal College of Music, à même pas dix-sept ans, Benjamin Britten avait déjà accumulé une expérience considérable, en tant que jeune compositeur doué d’une prodigieuse facilité. Officiellement, il étudia la composition avec John Ireland mais, comme l’ambiance du Royal College lui parut peu agréable, il dut bien plus à la tutelle inspirante de Frank Bridge, avec qui il avait pris des cours particuliers, pendant trois ans, avant de quitter son East Anglia natale pour descendre à Londres. Ce fut ainsi après avoir travaillé avec Bridge qu’il imagina une de ses plus belles juvenilia, les Quatre Chansons françaises orchestrales, écrites en 1928 pour les vingt-sept ans de mariage de ses parents et—comme nombre de ses partitions antérieures au College—jouées seulement après sa mort, en 1976. Vu la masse de son œuvre d’adolescent, forcément inégale, ce ne fut pas sans quelques scrupules qu’il y renonça quand son style abouti se mit à s’affirmer, comme ce fut le cas, il le sentit, avec sa Sinfonietta (1933, sa seule pièce à avoir été jouée au RCM pendant ses études), ses variations chorales A Boy was Born (1934) et son cycle de mélodies, politiquement fort, Our Hunting Fathers (1936). L’une des plus substantielles œuvres du Britten adolescent à avoir été sauvées de l’oubli est le Double Concerto en si mineur pour violon, alto et cordes qu’il rédigea entre le 9 mars et le 1er juillet 1932, pendant son avant-dernière année au RCM. Le premier mouvement fut écrit en deux petits jours et, le 10 mars, Britten nota fièrement dans son journal: «Je termine le premier mouvement de mon double concerto dans la soirée, après avoir beaucoup écrit.» Le lendemain, il montra cette musique à Ireland, son professeur qui, consigna-t-il dans son journal, fut «plutôt satisfait de mon concerto, pour l’heure». Le 17 mars, il reconsidéra divers aspects de sa partition: «J’ai apporté quelques modifications et fait pas mal d’ajouts à mon premier mouvement de concerto ce matin.» Il travailla au mouvement lent du 18 au 21 mars et termina le finale le 4 mai (le jour où il apprit qu’il avait gagné l’improbable somme de treize livres et treize shillings pour le Cobbett Prize du RCM). Puis il laissa de côté ce concerto pour se consacrer à sa Sinfonietta; l’œuvre inachevée est mentionnée une dernière fois dans son journal, à l’entrée du 1er juillet, jour où il revisita et termina le mouvement lent. Le 19 avril 1936, Britten assista à la création posthume du Concerto pour violon de Berg à l’International Society for Contemporary Music de Barcelone, un événement qu’il trouva «bouleversant». Il était venu interpréter sa Suite pour violon et piano (op. 6), diaboliquement ardue, aux côtés de l’ami de Frank Bridge, le violoniste Antonio Brosa (avec lequel il avait déjà gravé cette œuvre au Royaume-Uni). Il resta en contact avec lui après avoir émigré aux États-Unis, en mai 1939, époque à laquelle il avait commencé à son intention un substantiel Concerto pour violon («un gros poids lourd», disait-il alors) achevé au Québec, plus tard cet été-là. Il en prépara la réduction pianistique à New York (où il allait s’installer) et poursuivit le travail d’orchestration en septembre, avec l’espoir qu’une première étasunienne concourrait à sa réputation tout en permettant à Brosa de travailler davantage en Amérique. Le 21 novembre, il écrivit à son éditeur Ralph Hawkes, au sujet de la publication imminente de son Concerto: «Il me paraît un peu risqué de le graver sans avoir entendu Toni le jouer, mais je lui ai écrit en lui demandant d’être honnête et de me dire les passages inefficaces et les modifications qu’il suggère. J’espère aussi qu’il doigtera la partie de violon et notera les coups d’archet pour l’édition («edited by Antonio Brosa»).» Brosa se rendit à New York pour la création de l’œuvre (au Carnegie Hall, le 28 mars 1940, avec le New York Philharmonic Orchestra placé sous la baguette de John Barbirolli) après avoir été détenu, à son arrivée à Ellis Island, par des fonctionnaires de l’immigration le suspectant d’être un «visiteur douteux»—la faute, probablement, à sa citoyenneté espagnole. La première du Concerto pour violon fut globalement bien accueillie par le public et la critique. Indubitablement, cette pièce marqua, chez Britten, un nouveau degré de maturité, des plus perceptibles dans le finale prolongé, une Passacaille (structure qui sera parmi les plus typiques et les plus inventives du compositeur). Dans le New York Times, Olin Downes écrivit: «M. Britten nous a offert, dans la forme du concerto pour violon, une chose au parfum d’authentique originalité … La musique passe par le poétique, le satirique, l’élégiaque … L’instrumentation, parfois toute simple, souvent très brillante, est si experte que le violon n’est jamais couvert quand il doit être mis en avant.» Comme plus tôt dans la carrière de Britten, cependant, certains commentateurs prirent un malin plaisir à égratigner cette œuvre—une propension qui se fit particulièrement sentir après la création britannique, au Queen’s Hall de Londres, le 6 avril 1941 (le soliste Thomas Matthews était alors accompagné par le London Philharmonic Orchestra avec, à sa tête, Basil Cameron). The Times, par exemple, déclara le 7 avril: «Si le public a parfois trouvé cela pénible, il a fait contre mauvaise fortune bon cœur et applaudi avec zèle quand ce fut fini. Notre sentiment à nous fut la déception d’être parvenu à si peu en partant d’une telle démonstration d’efforts ingénieux.» Quant au Liverpool Daily Post, il se demanda si le concerto était «vraiment trop intelligent» mais souligna les «moments d’authentique poésie symphonique». Par la suite, Britten le révisa à plusieurs reprises—en 1950, 1958 et 1965—, en partie (et un peu ironiquement) pour supprimer ce qui, à ses yeux, avait été le travail excessif mené par Brosa sur la partie soliste, mais aussi pour rectifier les proportions du finale. Il dédia la partition à son ami et condisciple au RCM, Henry Boys qui, pianiste compétent, avait (sur la suggestion du compositeur) accompagné Brosa quand ce dernier avait répété l’œuvre au Royaume-Uni et quand il l’avait présentée à Barbirolli avant de gagner l’Amérique pour la première. «Réflexions sur un chant de Dowland», les Lachrymae furent écrites en avril 1950 pour l’altiste écossais William Primrose qui en créa la version originale pour alto et piano, aux côtés du compositeur, au festival d’Aldeburgh de cette année-là. La partie de piano fut ultérieurement arrangée pour un petit orchestre à cordes (fait inhabituel, sans les parties de premier violon), en 1976, sur la suggestion de Cecil Aronowitz qui la joua au festival d’Aldeburgh l’année suivante, six mois après la mort de Britten. Ces Lachrymae sont une convaincante synthèse de divers éléments musicaux vecteurs d’une forte dimension personnelle pour le compositeur. Ce dernier avait été altiste dès l’enfance et s’il ne nous a laissé, au disque, qu’une modeste contribution (une note unique, mais essentielle) dans la Fantasia Upon One Note de Purcell avec le Zorian Quartet, en 1946, il a exploité à fond l’aptitude de l’alto à produire des sonorités intensément douces dans les œuvres de chambre et les pages orchestrales. Couler les Lachrymae dans une série de variations se développant sans heurts lui permit de s’appuyer sur sa vaste expérience de cette structure, acquise dans les années 1930 et 1940. Et en fondant sa pièce sur le fameux chant de John Dowland «If my complaints could passions move» (First Booke of Songs or Ayres, 1597), il perpétua la célébration de son héritage musicalo-littéraire anglais qui, depuis son retour d’Amérique (au début des années 1940), avait constitué une part fondamentale de son art. Au milieu de l’œuvre, il fait allusion à un autre chant célèbre de Dowland, «Flow my tears» (Second Booke, 1600). Le thème de Dowland a une forte forme ascendante et descendante qui rend les transformations britteniennes d’emblée intelligibles à l’auditeur. Les allusions en trémolo à son profil mélodique, au début, annoncent une paisible exposition du thème aux cordes inférieures, mais l’harmonie demeure complexe et insaisissable jusqu’à la toute fin de l’œuvre quand, dans un moment techniquement habile et artistiquement magique, la musique de Britten se fond peu à peu dans l’idiome harmonique, simple mais expressif, du chant original de Dowland. Cette idée d’un thème et variations «inverse», pour ainsi dire, Britten l’adoptera dans son second corpus de «réflexions» dowlandiennes pour guitare solo, Nocturnal (composé pour Julian Bream en 1963 et enregistré sur le disque CDA67648), et dans le traitement des thèmes russes, dans sa Suite pour violoncelle no 3 (composée pour Mstislav Rostropovitch en 1971). Als Benjamin Britten am 22. September 1930 im Alter von knapp 17 Jahren dank eines Stipendiums am Royal College of Music (RCM) in London zu studieren begann, verfügte der außerordentlich begabte junge Komponist bereits über einen reichen Erfahrungsschatz. Obwohl er offiziell Komposition bei John Ireland am Royal College of Music studierte, empfand er die Atmosphäre an der Bildungseinrichtung als unangenehm und verdankte der inspirierenden Anleitung von Frank Bridge, bei dem er vor seinem Umzug aus seiner Heimat in East Anglia nach London drei Jahre lang Privatunterricht erhalten hatte, weitaus mehr. So komponierte Britten, nachdem er mit Bridge zusammengearbeitet hatte, zum Beispiel die Quatre Chansons françaises (1928) für Orchester: eines seiner besten Jugendwerke, das er anlässlich des 27. Hochzeitstages seiner Eltern schrieb und das—wie so viele Kompositionen Brittens, die vor seinem Studium entstanden—erst nach dem Tod des Komponisten im Jahre 1976 aufgeführt wurde. Da er in seinen Jugendjahren ein großes Korpus an Werken, mit zwangsläufig recht unterschiedlicher Qualität, komponiert hatte, konnte er sich guten Gewissens davon abwenden, als sich sein reifer Kompositionsstil zu äußern begann. Das geschah, seiner Ansicht nach, mit seiner Sinfonietta (von 1933; sein einziges Werk, das am RCM während seiner Studienzeit dort aufgeführt wurde), den Chorvariationen A Boy was Born (1934) und dem politisch brisanten Liederzyklus Our Hunting Fathers (1936). Eines der umfangreichsten Jugendwerke Brittens, das aus der Vergessenheit gerettet wurde, ist das Doppelkonzert in h-Moll für Geige, Bratsche und Streicher, das er zwischen dem 9. März und dem 1. Juli 1932, seinem vorletzten Studienjahr am RCM, komponierte. Der erste Satz entstand innerhalb von nur zwei Tagen; am 10. März notierte Britten stolz in seinem Tagebuch: „Der erste Satz meines Doppelkonzerts ist am Abend fertig geworden und ich habe viel geschrieben.“ Am folgenden Tag zeigte er Ireland sein Werk und vermerkte in seinem Tagebuch, dass sein Lehrer „mit meinem Konzert soweit ganz zufrieden“ war. Am 17. März überarbeitete Britten die Partitur an verschiedenen Stellen: „Ich nehme mehrere Änderungen vor & füge morgens dem 1. Satz so einiges hinzu.“ Vom 18. bis zum 21. März arbeitete er an dem langsamen Satz und vollendete das Finale am 4. Mai (am selben Tag wurde er darüber informiert, dass er die merkwürdige Summe von £13.13s von dem Cobbett Prize des RCM erhalten sollte). Er legte das Konzert dann beiseite, um sich ausschließlich der Sinfonietta zu widmen; der letzte Tagebucheintrag, der sich auf das unvollendete Stück bezieht, ist auf den 1. Juli datiert, als er den langsamen Satz überarbeitete und fertigstellte. Das Doppelkonzert wurde nach langer Verzögerung schließlich am 15. Juni 1997 im Rahmen des 50. Aldeburgh Festivals von Katherine Hunka und Philip Dukes zusammen mit dem Britten–Pears Orchestra unter der Leitung von Kent Nagano uraufgeführt (der im darauffolgenden Jahr auch die erste Einspielung des Werks dirigierte, die mit den Solisten Gidon Kremer und Yuri Bashmet zusammen mit dem Hallé Orchestra für das Label Erato entstand). Colin Matthews, der Brittens Particell zu einer vollständigen Orchesterpartitur ausarbeitete und anmerkte, dass das Manuskript „praktisch in allen Einzelheiten vollständig“ sei, war der Ansicht, dass der Grund für die plötzliche Abwendung des Komponisten von diesem Werk seine zunehmende Unzufriedenheit mit der Darbietungskultur am RCM war. Die Erfahrungen, die er machte, als er seine Sinfonietta proben wollte, müssen entmutigend gewesen sein. Am 22. September vermerkte Britten in seinem Tagebuch: „Noch nie habe ich einen so schrecklichen Krach anhören müssen!“ Genau eine Woche später schrieb er: „Ich traf um 11 Uhr am RCM zu der abscheulichsten Probe meiner Sinfonietta ein“ (mehrere Instrumentalisten waren nicht gekommen); am 13. Oktober musste er „die grauenhafteste aller Proben meiner Sinfonietta“ erdulden—„Welch’ eine Einrichtung“. fügte er hinzu. Am nächsten Tag berichtete er, dass „neue Maßnahmen“ getroffen worden seien, damit seine „Sinf. weniger nach blutarmen Katzen klingen würde“. Am 19. April 1936 wohnte Britten der posthumen ersten Aufführung von Bergs Violinkonzert bei, die bei der Internationalen Gesellschaft für Zeitgenössische Musik in Barcelona stattfand. Er empfand diese Erfahrung als „niederschmetternd“. Britten war dorthin gereist, um seine ausgesprochen schwierige Suite für Violine und Klavier (op. 6) zusammen mit Frank Bridges Freund, dem Geiger Antonio Brosa, mit dem er das Werk bereits in Großbritannien für das Radio eingespielt hatte, aufzuführen. Auch nachdem der Komponist im Mai 1939 in die Vereinigten Staaten emigriert war, blieben Britten und Brosa noch im Kontakt, und zu dem Zeitpunkt hatte Britten bereits mit der Arbeit an einem umfangreichen Violinkonzert für den Solisten begonnen (der Komponist bezeichnete es zu jener Zeit als „ein großes Schwergewicht“). Das Konzert wurde noch im Sommer desselben Jahres in Quebec fertiggestellt. In New York (wo er sich dann niederließ) bereitete Britten den Klavierauszug vor und arbeitete im September dann an der Orchestrierung des Werkes. Britten hoffte, dass eine Uraufführung in den USA nicht nur seine eigene Karriere befördern, sondern auch Brosa weitere Engagements einbringen würde. Der Komponist schrieb an seinen Verleger, Ralph Hawkes, am 21. November über die bevorstehende Publikation des Werks: „Es scheint etwas riskant, es zu drucken, bevor ich es Toni habe spielen hören, aber ich habe ihm geschrieben und ihn gebeten, mir ehrlich zu sagen, welche Passagen wirkungslos sind und was er für Änderungen vorschlägt. Außerdem hoffe ich, dass er die Solostimme für die Ausgabe mit Fingersatz und Strichbezeichnung versieht (‚herausgegeben von Antonio Brosa‘).“ Brosa reiste nach New York, um dort an der Uraufführung mitzuwirken. Diese wurde—nachdem er von der Einreisebehörde (vermutlich aufgrund seiner spanischen Staatsbürgerschaft) als „zweifelhafter Besucher“ verdächtigt und deshalb auf Ellis Island festgehalten worden war—am 28. März 1940 in der Carnegie Hall zusammen mit dem New York Philharmonic Orchestra unter der Leitung von John Barbirolli gegeben. Die Premiere des Violinkonzerts wurde im Großen und Ganzen sowohl vom Publikum als auch von den Musikkritikern gut aufgenommen. Zweifellos steht das Stück für eine neue Dimension der Reife in Brittens Musik, die sich am deutlichsten in dem ausgedehnten Passacaglia-Finale äußert (eine Form, die später eine besonders charakteristische und originelle Struktur des Komponisten werden sollte). In der New York Times schrieb Olin Downes: „Herr Britten hat uns etwas präsentiert, das dem Genre des Violinkonzerts etwas wahrhaft Neues verleiht … Die Stimmungen in dieser Musik durchqueren das Poetische, das Satirische und das Elegische … die Instrumentierung, zuweilen sehr schlicht und oft ausgesprochen brillant, ist derart fachmännisch gehandhabt, dass die Violine nie verdeckt wird, wenn sie hervortreten soll.“ Wie jedoch bereits zu einem früheren Zeitpunkt in Brittens Karriere fanden einige Kritiker offenbar Gefallen daran, an seiner Leistung Fehler zu suchen, und diese Tendenz kam besonders zum Vorschein, als das Werk etwas später zum ersten Mal in Großbritannien aufgeführt wurde, nämlich am 6. April 1941 in der Londoner Queen’s Hall mit dem Geiger Thomas Matthews und dem London Philharmonic Orchestra unter der Leitung von Basil Cameron. So verkündete die Times zum Beispiel am 7. April: „Wenn das Publikum das Werk stellenweise etwas schwer verdaulich fand, dann ließ es sich nichts anmerken und applaudierte kräftig, als es vorbei war. Unser eigener Eindruck war einer der Enttäuschung darüber, dass bei einer so großartigen, erfindungsreichen und aufwändigen Darstellung nur so wenig erreicht wird.“ Die Liverpool Daily Post fragte sich, ob das Konzert „in Wirklichkeit zu raffiniert“ sei, bemerkte jedoch die „Augenblicke wahrer Ton-Poesie“. Britten überarbeitete das Werk später mehrmals—in den Jahren 1950, 1958 und 1965—einerseits (ironischerweise) um die Passagen in der Solostimme auszubügeln, die für seinen Geschmack von Brosa zu sehr verändert worden waren, und andererseits um die Proportionen des Finales umzugestalten. Die Partitur war Brittens Freund Henry Boys gewidmet, der mit ihm zusammen am RCM studiert hatte. Boys war ein begabter Pianist und hatte (auf den Vorschlag des Komponisten hin) Brosa bei Proben des Stücks in Großbritannien sowie einem Vorspiel für Barbirolli begleitet, bevor er nach Amerika reiste, um dort die Uraufführung zu geben. Lachrymae, Brittens „Reflexionen über ein Lied von Dowland“, entstand im April 1950 für den schottischen Bratschisten William Primrose und wurde erstmals—in der ursprünglichen Version für Bratsche und Klavier—von dem Widmungsträger und dem Komponisten noch im selben Jahr beim Aldeburgh Festival aufgeführt. Der Klavierpart wurde später, im Jahre 1976, für kleines Streichorchester (ungewöhnlicherweise ohne erste Violinen) auf den Vorschlag von Cecil Aronowitz hin arrangiert, der es beim Aldeburgh Festival im folgenden Jahr, sechs Monate nach Brittens Tod, aufführte. Das Werk stellt eine befriedigende Synthese verschiedener musikalischer Elemente dar, die für den Komponisten von besonderer persönlicher Bedeutung waren. Er hatte seit seiner Kindheit Bratsche gespielt und obwohl sein Vermächtnis als Bratscher auf Tonband aus lediglich einem einzelnen (allerdings wesentlichen) Ton in Purcells Fantasia Upon One Note mit dem Zorian Quartet (1946) besteht, schöpfte er das intensiv-samtige Klangpotenzial der Bratsche sowohl in Orchesterwerken als auch in Kammermusik voll aus. Die Lachrymae legte Britten als ineinander übergehende Variationen an und griff damit auf seinen reichen Erfahrungsschatz zurück, den er sich für diese musikalische Struktur in den 1930er und 40er Jahren angeeignet hatte. Seit seiner Rückkehr aus Amerika zu Beginn der 40er Jahre hatte sein englisches Kulturerbe eine wichtige Rolle in seiner Kunst eingenommen. Mit der Auswahl eines berühmten Liedes von John Dowland („If my complaints could passions move“ aus dem First Booke of Songes or Ayres von 1597) als Grundlage für Lachrymae setzte er diese Tradition fort. In der Mitte des Stücks spielt Britten auf ein weiteres berühmtes Dowland-Lied an: „Flow my tears“ (Second Booke, 1600). Dowlands Thema hat eine stark ansteigende und abfallende Form, so dass Brittens Bearbeitung des Liedes für den Hörer leicht nachvollziehbar ist. Tremolo-Anspielungen an das melodische Profil zu Beginn kündigen eine ruhige Darbietung des Themas in den tieferen Streichern an, während die Harmonie durchweg komplex und schwer fassbar bleibt, bis Brittens Musik ganz am Ende—in einem Moment von technischem Geschick und künstlerischer Zauberei—allmählich in die schlichte, jedoch expressive harmonische Klangsprache des Dowlandschen Lieds übergeht. Dieses Konzept eines Themas mit Variationen, das sozusagen „rückwärts“ erscheint, verwendete Britten später nochmals, als er 1963 für Julian Bream seinen zweiten Zyklus mit „Dowland-Reflexionen“ für Sologitarre, Nocturnal, schrieb (der bei Hyperion auf CDA67648 vorliegt) und als er 1971 russische Themen in seiner Cello-Suite Nr. 3 verarbeitete, die er für Mstislaw Rostropowitsch komponierte.